You want quality over quantity. We provide the high-end basics that meet your living needs—trendy countertops, tile backsplash, an open layout—plus all the extras. The luxury bed, the sofa, the dining table and chairs, the washer and dryer, it’s all included in this unit. Swipe right on our furnished apartments for rent in Galloway Neighborhood today. 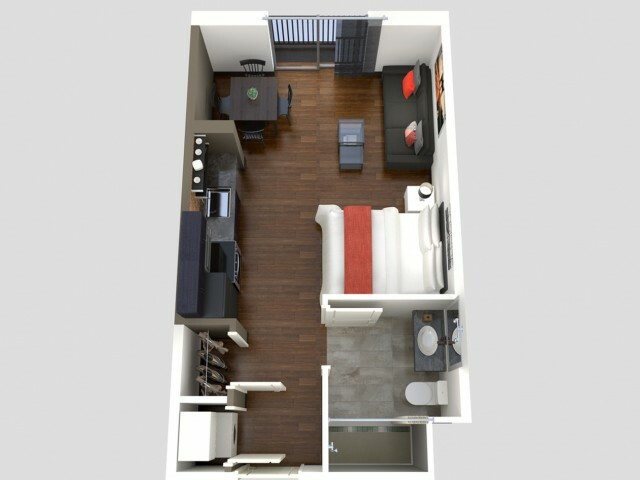 We’ve got the studio apartment floor plan you see above, and a furnished one-bedroom loft for a little more privacy. Already have your own furniture? Check out our unfurnished studio apartments for rent! **	SQFT listed is an approximate value for each Available Now!. Dog and Cats accepted with a $200 pet fee. Some breed restrictions will apply. 3 pet maximum.